A wide range of native wildlife depend on tree hollows for different purposes. Mammals that use tree hollows include Ringtail and Brushtail Possums; Greater, Squirrel, Sugar and Feather-tail Gliders; as well as Microbats. Tree hollows take a long time to form and usually occur in trees at least 100-200 years old. As a result of tree clearing, tree-hollows are an increasingly scarce resource in the Australian landscape. While work is underway to plant native gardens, actively regenerate areas and restore landscapes, the significant time involved in growing trees to an age where they form hollows creates a shortage. If wildlife cannot find appropriate tree hollows, they cannot successfully breed. This means that if suitable hollows are not available for them to use, they may not survive in the area and become locally extinct. Nest boxes can play a vital role as substitutes for hollows, providing nesting opportunities for a wide range of wildlife. Will wildlife use nest boxes? 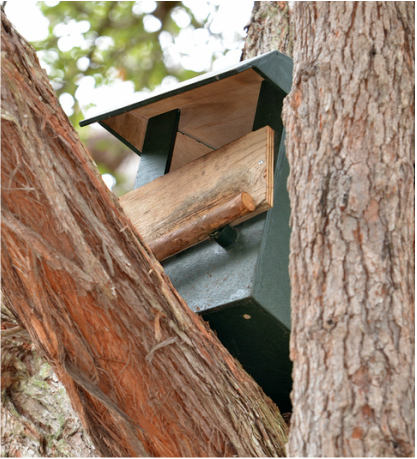 Nest boxes are successful in bush blocks, urban residential properties, public parks and farm forestry plantations. However, nest boxes alone do not attract wildlife. They must be located close to the resources of food, water, shelter and mates. Orientation - nest boxes should be protected with the entrance facing away from prevailing weather. Protection - many mammals prefer nest boxes to be placed among dense foliage for protection against predators. Shading - nest boxes should be shaded from the midday sun.